Managing time, and paying on the same time is a complex task especially with a large number of employees. Time Master can help you achieve this with ease and minimal manual intervention. Our Time Master suite is a complete system including a choice of hardware clocking systems, and software that fits easily into your business structure and gives greater control over your workforce. You can choose from a wide range of hardware clocking devices such as the tamper proof hand punch machine, a finger print reader or a card based machine. Time Master is designed and developed to cater for all sizes and types of organizations from the small to medium to the large sized and its unique scalable and parameterized system makes it versatile to suit the needs of organizations across industries and sectors. Time Master has been installed and is successfully running in more than 200 units in sub-Saharan Africa ranging from agro based farms to manufacturing units to hotels and lodges, steel plants, banks, and retail outlets. 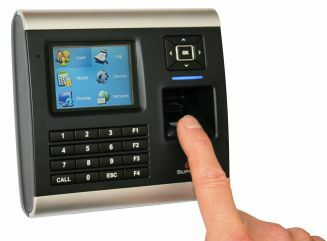 Communication Module: We have made a strong communication module that allows for our software to be fully integrated with hand punch machines, finger print readers and the proximity RFID card readers. Multiple technologies can work on the same software, providing the flexibility required by the end user. Shift Management: A fully functional and easy to use shift management module that allows for assigning of shifts to employees with ample flexibility. Multiple shifts can be assigned on different days, weeks or for different months as and when required. Leave Management: A comprehensive module that allows the user to create an unlimited amount of leave days as per company policy, and assign to employees as and when required. An adjustment of absenteeism to leave days is also possible..
Manual Adjustments: For pre specified and authorized users, the system is flexible enough to permit manual adjustments to suit particular needs. Multi-level Integration: Apart from the possibility of integrating Time Master with our payroll software, Paymaster, there are other solutions such as the access control system which can also be integrated directly into the Time Master and share the same employees database to save on data capture a second time. Overtime Authorization: On several occasions, it is important to not only control overtime but also the basis on which it is to be paid. With our easy to use OT authorization, users can define the exact amount of overtime to be permitted per employee per day or on a particular day. TA reports: With Over a 100 reports, the Time master gives users exactly what is required regarding any time and attendance based queries. A report writer allows for users to create their own reports within the scope of the system. Feature of manual attendance register is available in case of clock malfunction.